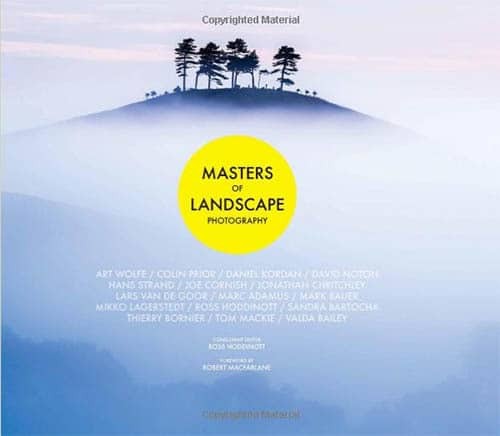 When I first came across the book “Masters of Landscape Photography” it appeared at first glance to be a book of photos. Ordinarily I wouldn’t entertain a book such as this, but following an email from Amazon, I decided to make a purchase. Having now received and spent some time browsing the book, I’m very pleased I took the risk. The book features the work of 16 photographers. Some are well-known in the photography community, whilst others I suspect may be new to you. Several of the names were certainly new to me. What I can say is that all the photographers produce exceptional work and have been well selected. Well done to Ross Hoddinott who was the Consultant Editor for the book. Masters of Landscape Photography is a large book in terms of physical dimensions, certainly larger than I’d expected. It measures 11.5 inches x 9.5 inches and has a hard-backed matte cover. There are 176 pages, but the paper is a high-quality meaning its quite heavy. The paper has a nice egg shell finish which has allowed the printing to be of an excellent standard for a book in this price range. The binding of the book feels good and appears quite robust. It should last well even if used frequently. Another feature I like is the ribbon page marker like that found in diaries; I wish more book publishers would include one of these. At the start of the book there is a brief introduction. The book is then arranged into chapters, each featuring a different photographer. The photographers are listed in alphabetical order making it quite easy to browse if you’re looking for someone. At the start of each chapter is a brief introduction to the photographer covered, accompanied by one of their images. The following two pages then feature further images. Then comes a series of questions and answers, together with a further photograph. There are then two photographs followed by further page of questions and answers. The chapter is rounded off by thumbnails of the photographs, accompanied by the technical information from the photographer. This is information relating to the location and equipment used/camera settings chosen. At the end of the book is a brief entry for each photographer together with website and contact information. Overall this is an excellent design which has been well thought through. The question I’m sure you’re asking yourself is “are the photographs good?” The simple answer to this is no they are excellent. Several the photographers featured may be familiar names to you, for example Colin Prior. I was particularly pleased to see the image of “Trango Towers” was featured for Colin. This is a superb image. Having seen a 30-inch print close-up it’s one of my all-time favourites. Another name you may be familiar with is that of Joe Cornish. Whilst I fully expected to see some of Jones more famous works, I was delighted to see more recent images instead. Again, all are excellent images typical of the Joe Cornish style. Depending on your interest in photography there are many other great photographers who you may not have come across. Art Wolfe whilst well-known in some countries may not be that familiar to everyone. Art has very interesting perspective on the landscape and the book includes some of his more abstract images. Another name that may be new to you is Hans Strand. I find the work of Hans very calming. He has a wonderful ability to create order out of chaos. His images often feature amazing levels of detail which somehow, he arranges into wonderful compositions. One photographer who was new to me is Lars Van Der Goor. I find his woodland scenes have a mystical quality that captures your imagination. I absolutely love his photography. Another photographer who may be more familiar with our American readers is Marc Adamus. Whilst I wasn’t familiar with Marc’s name, it’s interesting that I had seen several of his images printed in the gallery chain YellowKorner. I recall at the time thinking these were spectacular but not paying much attention to the photographers. Now I know who Mark is I will be looking for more of his work. I quickly came to realise this book is much more than a collection of images. It’s a very interesting read for the photographer wishing to understand other people’s work and approach. If you like exploring the photography of others I would recommend investing in this book. If you consider buying this book, please use the links on this page and help to support Lenscraft. Lenscraft receives a small affiliate commission from Amazon when a purchase is made. This money helps to cover the running costs of the Lenscraft website. You can find more photography book reviews on the Book Reviews page. If you have a personal favourite that I haven't covered, please let me know so I can consider it for the future.